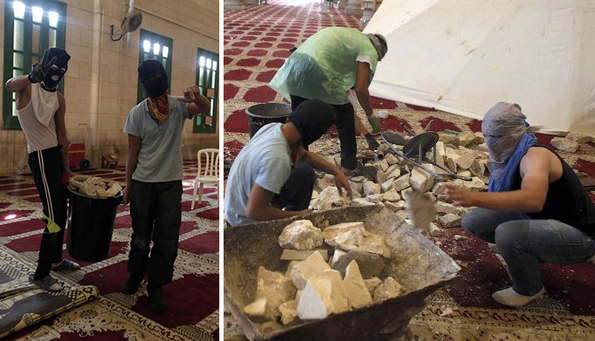 Palestinian Arab young men inside Al-Aqsa Mosque stockpile rocks to use for throwing at Jews who visit the Temple Mount (September 27, 2015). (GATESTONE INSTITUTE)—Why is the Palestinian Authority (PA) opposed to Jordan's proposal to install surveillance cameras at Jerusalem's Temple Mount, sacred to Christians, Muslims and Jews? This is the question that many in Jordan have been asking in light of the recent agreement between Israel and Jordan that was reached under the auspices of US Secretary of State John Kerry. The idea was first raised by Jordan's King Abdullah in a bid to ease tensions at the holy site in the Old City of Jerusalem. Shortly after Israel accepted the idea, the Palestinian Authority rushed to denounce it as a "new trap." PA Foreign Minister Riad al-Malki and other officials in Ramallah expressed concern that Israel would use the cameras to "arrest Palestinians under the pretext of incitement." During the past two years, the Palestinian Authority and other parties, including Hamas and the Islamic Movement (Northern Branch) in Israel, have been waging a campaign of incitement against Jewish visits to the Temple Mount. The campaign claimed that Jews were planning to destroy Al-Aqsa Mosque. In an attempt to prevent Jews from entering the approximately 37-acre site, the Palestinian Authority and the Islamic Movement in Israel hired scores of Muslim men and women to harass the Jewish visitors and the police officers escorting them. The men are referred to as Murabitoun, while the women are called Murabitat (defenders or guardians of the faith). These men and women have since been filmed shouting and trying to assault Jews and policemen at the Temple Mount. This type of video evidence is something that the Palestinian Authority is trying to avoid. The PA, together with the Islamic Movement, wants the men and women to continue harassing the Jews under the pretext of "defending" the Al-Aqsa Mosque from "destruction" and "contamination." The cameras are also likely to refute the claim that Jews are "violently invading" Al-Aqsa Mosque and holding prayers at the Temple Mount. The Palestinian Authority, Hamas and the Islamic Movement have long been describing the Jewish visits as a "provocative and violent incursion" into Al-Aqsa Mosque. But now the cameras will show that Jews do not enter Al-Aqsa Mosque, as the Palestinians have been claiming.